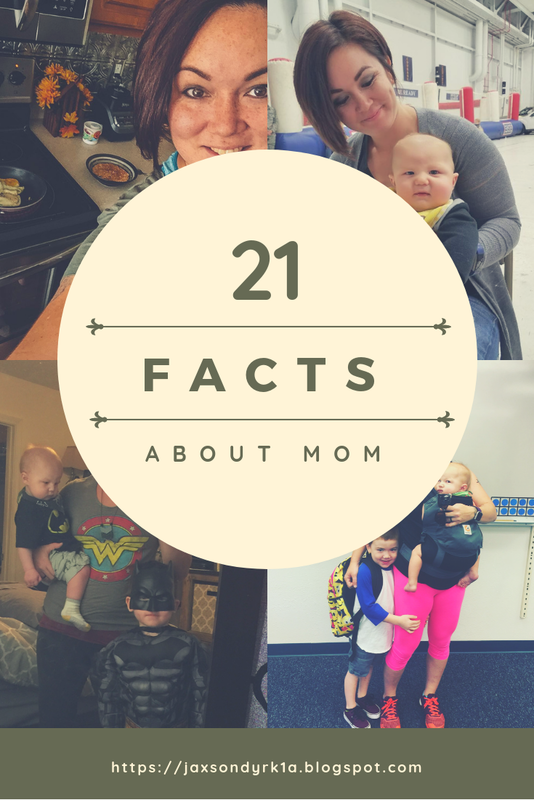 Wanted to give our readers some facts about mom! I am half Okinawan and a mix of Irish, Swedish, Welsh, German, and French Canadian. I took ten years of karate and I am a third degree black belt. I have two tuxedo cats: Oreo and Voltron. I was an Air Force brat. I’m very self-conscious AND super awkward. I’m currently taking classes towards a degree in Medical Billing and Coding BUT I do have a B.S. in Health Care Administration. Buffy the Vampire Slayer is my jam. Knew my husband THREE months before we married–celebrated NINE years this past April. I have an addiction to donuts. I hate the summer–specifically the humidity. I have an unhealthy obsession with leggings/yoga pants. I am an active duty USMC spouse. Thank you for taking the time to read about Jaxson and his family! 22. You are a rock star of a Mom. Wow! You are mega woman! I was showing my husband tour video of you power lifting last night!